Carpal Tunnel is a common occurrence affecting much of our population today. With increased computer use, repetitive motions being performed at work, gaming systems and texting, this condition is becoming even more prevalent. Frequently asked questions are below. The carpal tunnel is a narrow space that threads it way between the small bones in the wrist. This “tunnel” serves as a conduit for tendons, blood vessels and nerves extending from the arm into the hand. It also houses the median nerve, the nerve responsible for motor and sensory signals in the thumb and first three fingers of the hand. 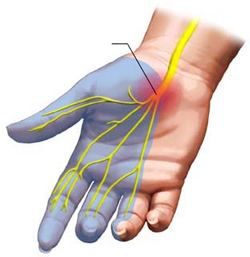 If the tissues around the tendons become inflamed and swell up, they crowd the median nerve within the carpal tunnel, pinching it and impairing its ability to conduct signals properly. 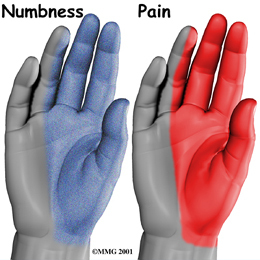 This causes physical symptoms of pain, numbness and difficulty using your hand. Some people are actually born with unusually narrow carpal tunnels, making them naturally prone to the disorder. But you can also develop it as the result over constant flexing of the wrist or hand, which produces chronic inflammation. Even holding your wrist in an unhealthy position for long periods of time can inflame the carpal tunnel. This can happen to people who sit the majority of their day or perform repetitive activities such as hairdressers and those that use a computer a lot through the day. For most patients, the cause of their carpal tunnel syndrome is unknown. Any condition that exerts pressure on the median nerve at the wrist can cause carpal tunnel syndrome. Common conditions that lead to carpal tunnel syndrome can include obesity, pregnancy, hypothyroidism, arthritis, diabetes, trauma, and tendon inflammation. Carpal tunnel syndrome may cause pain, numbness, tingling or “electrical” sensations in the fingers, hand, wrist or arm. In some cases the pain may radiate all the up into the shoulder. Muscle weakness may show itself as loss of coordination or loss of gripping ability. In some cases, symptoms can refer up into the shoulder. Can other conditions causes these symptoms? Any condition that affects the median nerve can produce similar symptoms. Your physical therapist will help to differentiate carpal tunnel from other possible conditions. Do I have to have surgery for this condition? While carpal tunnel surgery does work for some people, it can produce lasting side effects and may require a lengthy recovery period. Our team of amazing physical therapists can help resolve the condition non-invasively. We have a high success rate of resolving this condition without surgery, drugs or injections! If you have more questions, feel free to reach out to our team. Call us today at (828) 348-1780 to see what we can do for you! You can also learn more about Carpal Tunnel HERE.